...and while on the topic of Lives of Girls and Women, that book's epilogue features Del Jordan's recollection of her unlovable home town, and as far as the story is concerned it's the final glimpse and Del's closing thoughts. Amongst other things, the epilogue draws a distinction between Del as a young artist and the narrating Del who is, Munro implies, maturer and somehow a truer artist. She's looking back at the town where she was born and also at her younger, less knowing self. In limbo between finishing high school and beginning the rest of her life, Del plans to write a novel that's vengeful in the sense that she imagines converting Jubilee and its citizens into a gallery of grotesques. Her parting gift, then, will be to satirically pillory the very place whose values restricted and oppressed her. She doesn't write that book, of course. Munro suggests that young Del's motivations are suspect and petty, and that the book (had it been written) would have been deeply flawed because it sought to judge and condemn rather than explore and understand. In a roundabout way, Munro seems to be presenting a moral/aesthetic preference in this epilogue, hinting that in her view (circa 1970) a better kind of art is produced when the artist lays aside hurts feelings or a desire to mock or ridicule those they feel frightened or hurt by. The model of realism Munro promotes here is of course merely one model for fiction. And while Del appears to champion it as the vision of artistic maturity and fullness (satire, comedy, and absurdism, then, become inferior literary modes since their principal goal is not a questing and all-encompassing representation of actuality), she's one character in one work of fiction, and so her philosophy of aesthetics and the tie to artistic integrity sit there on the page, intriguing ideas to consider. Munro's model returned to mind last year when I read D.W. Wilson's Once You Break a Knuckle, in part because London-based Wilson's depiction of Invermere, his hometown, reminded me of the book the younger Del choose against writing. (Also, part of my personal distaste for the stories came from not appreciating the macho heterosexual white guys and what I perceived as the author's romantic valorising of their guns/trucks/fists/booze worldview; I grew up in small towns and saw enough of that brutality to understand the wisdom of fearing it.) More importantly, I felt like Wilson gave Invermere (its cultures, its people) short shrift: as a reader I wanted to learn about the breadth of the place being depicted, and with Knuckle it seemed that the author had narrowed his focus to a single kind of character at the expense of all others. 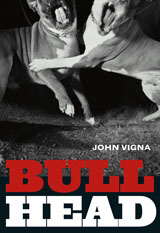 There are striking similarities between Knuckle and John Vigna's Bull Head, a collection of stories set in a remote British Columbia town not far from Invermere. Vigna also focusses on hard drinking heterosexual guys who are prone to fighting and struggling in their relationships with women (when they have them at all). Gun and trucks appear regularly too. And like Wilson, Vigna's view of his small town prefers to observe hard-luck men who hang out at a stripper bar or in taverns, shoot guns, quarrel, and so on. And after two or three such stories my personal response was, "Okay, enough with these guys. They're pathetic and uninteresting. What's happening in the rest of the town? Surely not everyone is an alcoholic, a stripper, or a prostitute? Isn't anyone happy? Where's the diversity of human experience and endeavour?" Although I understand and to a degree appreciate Vigna's aesthetic choice (just as I understand and appreciate—kinda, sorta—the numerous scions of the Vancouver School of photography who take picture after picture of ugly suburban tear downs, gaping pits from which condos will soon sprout, and concrete overpasses), as an urban reader with an interest in rural living I would have appreciated knowing/seeing more about the layers of the place and the kinds of people who live there (and their stories) rather than witnessing a single stratum of a masculine type whose limited options all seem to involve the same few choices. [The above is blog musing. The proper review appears in the Globe and Mail. Slightly over a 200km drive southeast from Invermere—an isolated settlement in which, according to the cautionary stories of D.W. Wilson’s Once You Break a Knuckle, the natural condition of mankind is still solitary, poor, nasty, and brutish (though not necessarily short)—stands Fernie (pop. 5,200), a coal mining town in BC’s Elk Valley that has lately gained favour for proximity to a ski resort.